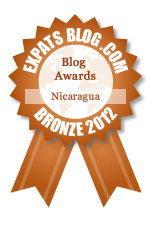 ExpatsBlog.com Expat Blog Awards 2012: Nicaragua Bronze Award! This blog won the Bronze Award for best expat blog in Nicaragua! As a single woman of 55, trying to figure out my options for future retirement, this blog - rewired and retired really put costs of living in perspective for me. I am convinced that I can live in Nicaragua and afford what is considered there a very nice lifestyle. Hope run away inflation and discovery by tourism doesnt change it before I get there. This was one of the first blogs I followed and it is really special! It's one of the reasons I ventured to Ometepe (one of the reasons I even knew about it) and it's just a really charming place. The blog is excellent - very creative and unexpected. I am always happy when an e-mail alerts me to a new post!